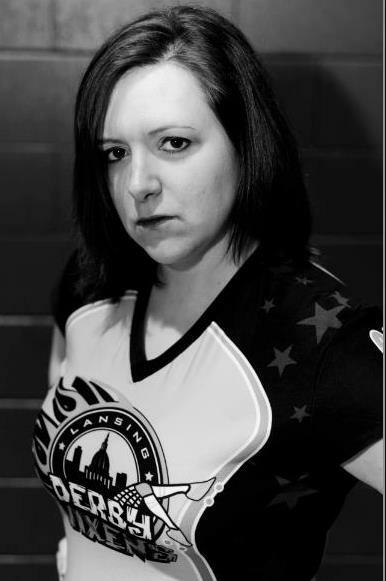 I am Addie Mortem, a blocker for the Lansing Derby Vixens roller derby league of Lansing, Michigan. I am also Jessica Knott, instructional designer at Michigan State University and PhD student in MSU’s nationally-ranked PhD program in Higher, Adult and Lifelong Education. Hence, I am a “smackademic,” as coined in a Chronicle of Higher Education article circa 2010 (http://chronicle.com/article/Smackademics-Join-the-Ranks/123670/). And I am not alone in my league as I am joined by criminal justice PhD student in criminal justice Ludacrush, PhD student in English Rue McSlamahan, PhD in music theory PhDemon, PhD in forestry House of Bruise, PhD student in educational administration Krizzy Azzbee, and Juris Doctor Little Hitaly. Roller derby isn’t that “academic by day, roller girl by night” experience everyone wants you to think it is. Well, maybe a little. Do I have tattoos? Yup. Do I hit other girls for fun? Sure. Roller derby is a full contact sport. It’s hard work, and you have to dedicate a lot of time and energy to yourself and, more importantly, to your team. No matter what kind of awful day I have, I know that at the end of it I am going to skate so many laps I won’t be able to stand upright – and that if I can stand upright I haven’t worked hard enough. There is something powerful in that. It’s hard to feel bad about your day when you’re fighting for air. This isn’t meant to be another one of those “Hey! I’m a rollergirl!” articles. Roller derby is as much a game of brains as it is a game about brawn. As good as it feels to use my 180 pounds to knock a girl down, it feels even better to arrange my fellow teammates on the track in a pattern that makes it scientifically more difficult for that girl to get through. It feels better to see her fight and huff and puff fighting against our strategy than it does to beat her up. Often, there seems to be concern about how to navigate the persona/professional balance between academia and roller derby. “What if they find me out?” I am fortunate that I’ve never had that problem. I can’t say it doesn’t exist, but I would say it’s not impossible to manage. Are you in a job where you feel like you can’t be yourself? Perhaps derby can be your outlet. After all, you do get to have an alter ego. To the smart girls who never felt like they had a place in sports – to the ones who focused on track and field and individual events where they could flex their craniums instead of their biceps – track down a league and give it a try. Last week, I played for the Michigan all-Star B team, the Mitten Kitten Black Cats, and won my first MVP award. You can be a nerd and an athlete. And have the most amazing time doing both. And still be you. You can be a professional and a rollergirl. It doesn’t have to be one or the other. And? You might just find a home.